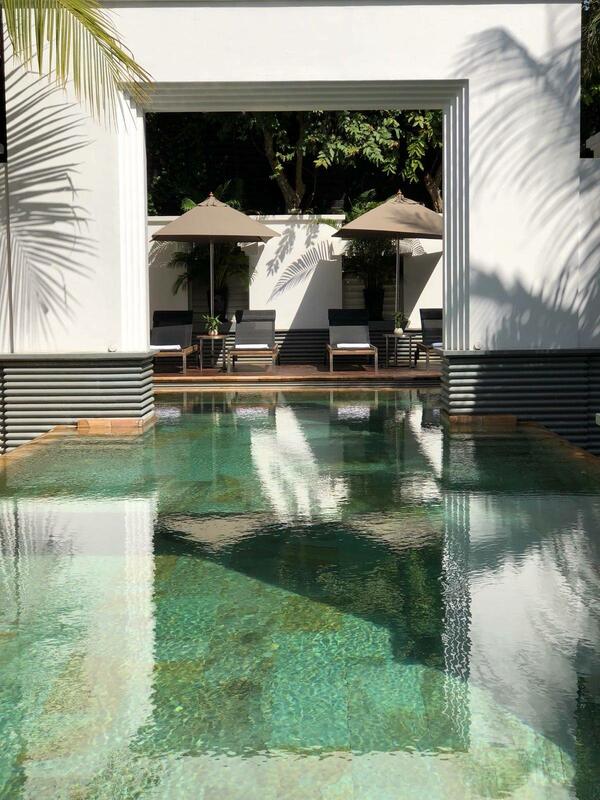 In my fairly extensive Southeast Asian travels, Siem Reap was a lacuna. No longer. Ensconced in a King Suite, pampered in a first class spa, exploring via tuk-tuk, or tramping the streets, I had it made, occasionally in the shade. I found shade beneath the parasols and cabanas on the apron of the hotel pool (one of two) where a traveler such as I could chill and reflect on travel days to come. The draw to Siem Reap is Angkor Wat and other temples, but the city, itself, is chock full of quaint and fancy restaurants, bars, and shops. After a day of serious tourism, the nighttime will be the right time to meander through the pungent streets and lanes. I’m eager to see the city. I’m eager to tour the Temples and delve into some local colour. I will. Located in the middle of the city, the Hyatt lobby is an eight-minute walk from Pub Street. I’ll explore the city and Temples tomorrow when I’m booked with Chhor, a highly-touted tour guide, who has put together an appealing agenda including Angkor Wat, Ta Prohm and Bayon temple, and also a local fishing community at Tonle Sap lake with a motor boat cruise and a picnic lunch with home-cooked foods. For the rest of my Day One, however, I will not resist the lure of my suite, the hotel amenities, and – ahhhhhhh – the spa. In the midst of this luxury and promise of exciting travel, though, there is a niggle. Yes, a niggle. I miss the Official Child of janiqueel.com, the celebrated Mr. C. Easy enough to chatter with the loquacious one from the Hyatt where the WiFi is simple and speedy. But tomorrow and the next days? Covered. As I did when in Europe last June, I’m packing the Changi Recommends WiFi Router. It’s great! It works from just about everywhere (at least everywhere that I’ve been). As I said in my article, I pick it up at the terminal on my way out and return it at the terminal when I’m back – back in the arms of my baby once more. Breaking news – now I can return it to the HYFE Cafe in beautiful downtown Tampines. So 21st Century! Having listened to the young one’s gurgles, I can relax in the comfort of My King Suite. Offering 13 suites and 104 rooms, there is plenty of room choice. The suites are of five variations Mine had a living room area, a TV in the bathroom (of course, I had it on), and many other amenities. A first for me, and an appreciated one, was the room safe. This one was special for being large enough to accommodate a laptop. What a boon! Why had I not seen this before? From now on I’ll include it in hotel reviews that I provide. Then I’ll invest in large-size room safe stocks. Compress Massage – Steamed herbal compresses carrying the relief of ginger, lemongrass and kaffir leaves are the perfect antidote to tension and pain. Aroma Facial – This purely natural, aromatic oil facial soothes and calms. Jasmine, ylang ylang, neroli and lavender come together to eliminate dryness, reduce fine lines and richly nourish. TURMERIC & MINT Body Scrub – A mixture of traditional herbs with turmeric powder which cleanses and removes tired skin cells. Add a sauna, and I’m so relaxed I can hardly walk. So I’ll take a tuk-tuk rather than walk the eight minutes to Pub Street. After that exceedingly soft landing in Siem Reap, I’m up early on Day Two to meet Chhor (give those double h’s a soft guttural sound. I never really mastered it). Soft-spoken and thoroughly knowledgeable, Chhor gave an introduction to the week’s agenda and off we went in our stylish sedan to see the crown jewel in Cambodia’s heritage crown – Angkor Wat. Chhor gave us plenty of rein to wander by myself, but was eager to gather his little contingent and give an enchanting description of the marvels in front of us. From the magnificence of the temple complex to the tiniest carving, Chhor made us feel as though we were learning, and that, with some luck, we might even remember. As the week proceeded, I visited Ta Prohm, the temple with the massive roots growing all over the stones, you would recognize the photos, I think. 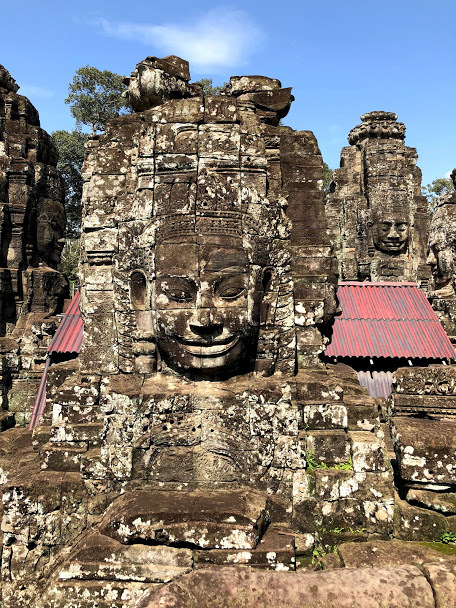 Another stop, Bayon Temple, is the one with the giant smiling faces. With all this large-scale smiling on a sunny, pleasant morning, I smiled, as well. On another day’s foray, Chhor led our little expedition to Tonle Sap Lake. Lying just about smack-dab in the middle of Cambodia, the lengthy lake empties at its southern end to form a river which flows to Phnom Penh and eventually the South China Sea. Imagine it as the heart of Southeast Asia, and you won’t be far wrong. Tonle Sap is a water world complete with a large, vibrant, exotic community made up mostly of Vietnamese. Shops, temples, crops, schools, and homes float on the surface of the lake. Calm that day, the lake can, in certain Seasons and weather, become not so peaceful making daily life a challenge. People here have made the best of a bad situation for decades, but it must be a tough life. Chhor’s enlightened guidance ensured that we contacted local life without condensation or embarrassment. Lunch was local, too. Served picnic style and delicious. What a setting! I highly recommend Chhor, can you tell? The Night Market sells scorpions and tarantulas to buy and eat. I didn’t and I didn’t. The word, ‘ICK’, sprang to mind. Always good for travel talk later, though. In times of stress I’ll try to remember those smiling faces of Bayon Temple. Recalling the Tomb Raider film, it was fun to let the action movie piece of my imagination loose as I roamed the carved stonework where it was partially set. The little village of Kedei was gorgeous. The lunch was delectable. My trip ended with an Apsara dance and dinner. So elegant. So mysterious. So provocative. Shunji Matsuo revived my hair!